So today we talk about the Ultimate Marvel Comics line up. First of all, I like the team-up roster for the Avengers. It’s not perfect, but it brings together several of the strongest characters in the Marvel universe and gets the ball rolling. That said, though, things go downhill from here in every Ultimate story. The Hulk has gone cannibal at least once since the opening comics for this spin-off series. That’s gross; I thought the Hulk wasn’t supposed to be a monster. And then this happens? As for Cap goading the Hulk into fighting his nemesis in the opening comics, since when did Steve Rogers let others fight his battles for him? Or set his eye on a lady who was already taken? This version of the character doesn’t deserve either the mantle of Captain America or the name of Steve Rogers, fellow writers. What the heck happened to Thor? This isn’t the Prince of Thunder that I’m familiar with by a long shot. And as for Iron Man, all I can say is ouch. Tony’s been getting a romantic pounding in this comic line, among a great many other scars. First off, having him date Natasha was a bad idea. Second, killing Jarvis is cruel. Third, why hasn’t Wasp ever had the chance to go one-on-one with Mystique before she had to rescue Tony? I’d love to see her beat Mystique into pancake batter; or any one of the Avengers or X-Men do it, actually. If that can ever be arranged, I’d be happy to take a look at it. As for Ultimate Natasha – come on! The whole reason she’s even interesting is because she turned her back on her past of wanton murder. If the Natasha of the mainstream comics ever meets Ultimate Natasha (should that Black Widow ever be brought back to the land of the living) she’d probably kill her on sight alone. The original Black Widow would never, ever, even think of killing one child, let alone three. In fact, she faced off against her boyfriend Daredevil when he tried to do it once, and it nearly cost her life to do that. It certainly put the kibosh on their romance. You’ve already heard my opinion of Ultimate Marvel Hawkeye: he’s as twisted and bent around as you can get, a total perversion of the original Clint Barton. Giving him a family was great (though why couldn’t it have been with Bobbi Morse?). And then, typical of the original character’s bad luck, it got yanked out from under him. Hard. So he kills the person responsible for this (Natasha? Really? It had to be Natasha who did it?) and yet he seems bent on getting himself killed in battle even after this act of vengeance. Okay, if he sees it that way, then why is he hiding in the dark? And as for the fates of Henry and Janet Pym, it’s cruel and unusual punishment. Bad enough that the Wasp has to put up with a ferociously abusive Hank, next she has to die. On top of that, she has to end up as someone’s main course to boot. Did cannibalism not die out in the Ultimate Marvel Comics universe? I’m beginning to think it didn’t. As for Pym – beating up on Wasp like that? Seriously? He was never a sadistic sort of man, even in his worst mental breakdowns. And the changed X-Men – ugh, talk about being perverted!!! Since when did the Prof. ever start considering robbing the cradle romantically? And having Kitty Pryde date Spidey?? That’s bad juice, people. And as for the other changes to the X-Men, I’d rather not think about it. Rogue and Iceman together just doesn’t work as well as Rogue and Gambit does. The FF has suffered here, too. Having a love triangle spring up with Reed, Sue, and Ben is just nasty. And on top of that, no one seems to be keeping an eye on Johnny. Sue, as I recall, was always much more protective of her younger brother even when he was old enough to take care of himself. Seriously, fellow writers? You get the chance to rewrite Marvel history, and it goes in this unhealthy direction? The characters were better off as zombies than they are as these versions, which must have come crawling out from under a rock. Is there a way to re-bury them? I’ve got plenty of shovels. I find it very, very sad. This could have been something much better. Instead, it portrays our heroes as resurrected, psychotic road kill. 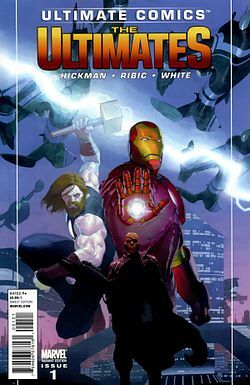 This entry was posted in Marvel Comics' Characters and Stories and tagged Ant-Man/Hank Pym, Black Widow, Black Widow/Natasha Romanoff, cannibalism, Captain America, Captain America/Steve Rogers, comics, dark themes, gross, Hawkeye, Hawkeye/Clint Barton, Hulk/Bruce Banner, Marvel, Marvel Comics, Marvel Comics' Characters and Stories, roadkill, superheroes, The Hulk, the ultimates, The Wasp, Ultimates, Wasp/Janet Van Dyne on June 8, 2013 by The Mithril Guardian.